Do you need some mutual fund investment advice? The following advice may not sound familiar to you, but investors don’t have to try to “beat the market”. Today we deliver some tips on investing in mutual funds for beginners who are new to the investment arena. Investors only need to match the market, which is easily achievable through the use of mutual funds. The benefits of mutual fund include low cost of entry and great diversification. And they are readily accessible to retail investors like us too. Top mutual funds to invest in are the index funds. Compared to other actively managed funds that charges high management fees and no guarantee of returns, index funds offer surprisingly good diversification and protection against adverse market movements. While we all desire the perfect risk-free investment that guarantees a high positive returns with zero risk or loss, such an investment vehicle simply doesn’t exist. No financial advisor can predict a downward swing in the market, and they cannot protect you from an economic downturn. The only way to have any level of protection is to hold a proper asset allocation (breakdown between stocks and bonds), according to your risk appetite and age. We will discuss the proportion of high risk and low risk mutual funds to invest in another article. In this article, we explore the rationale of investing in index funds over actively managed mutual funds. Why Index Funds Instead of Managed Funds? The debate of index funds vs actively managed mutual funds is decades long, and studies have shown that the chance of managed funds beating the index declines as years go by. The year-over-year performance of index funds will never be superior than the market returns, but it won’t be worse than the market returns as well. 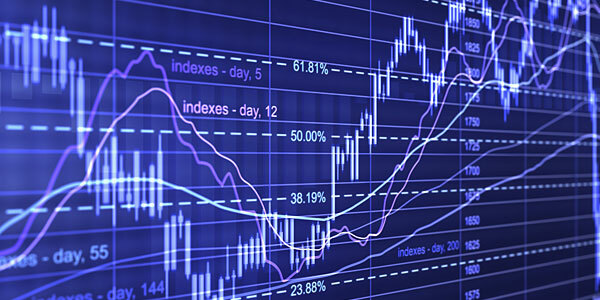 The index fund mimic its benchmark, for example the Vanguard 500 index (VFINX) fund mimics the S&P500, and the Vanguard Total Stock Market Index Fund (VTSMX) mimics the MSCI US Broad Market Index, which represents 99.5% or more of the total market capitalization of all the US common stocks traded on New York and American Stock Exchanges, and the NASDAQ over-the-counter market. On the other hand, for any given year, about 40% of actively managed equity funds have beaten the index annually since 2000. Which means, if you buy an actively managed fund, you have a 40% chance of beating the benchmark index fund. Doesn’t sound half bad, right? Wait till you read this – the 40% winning percentage is only for 1 year. 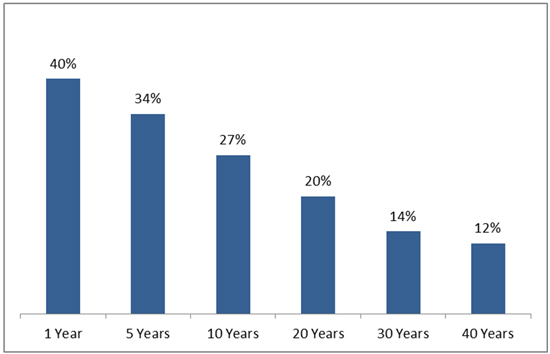 There is a gradual drop in the percentage of winning mutual funds over time. If we follow a managed fund vs its index benchmark over a 10 years period, the fund only has a 27% chance of beating the index. Remember – our goal of investing for financial freedom is to live off the dividend, interests and capital appreciation. So we are in it for a long haul, and we definitely want to keep invested for more than 10 years. If that’s the case, is there a way we can weed out the mutual funds that will lose to the index and invest in the right funds? The answer is simple: NO. There are winners, but good luck picking them. 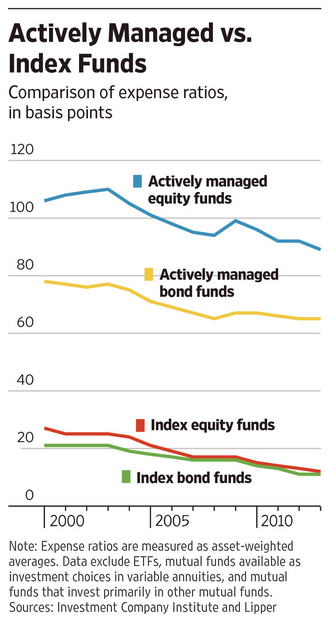 Why Do Actively Managed Funds Underperform? The management fees of actively managed funds are about 5 times higher than a comparable index fund. This added cost erodes the return of actively managed funds over time and is especially significant over a long period of time. Expense ratio is the percentage of fees paid to the mutual fund company to manage the fund, which includes all the administrative fees. The expense ratio of index funds are low because there is no active management involved. The fund simply mimic the indices, such as the components and proportions of S&P500. Imagine this – If the market returns 8% a year, an index fund with an expense ratio of 0.2% will return 7.8% on that particular year. An actively managed fund with an expense ratio of 1.2% will need to achieve a 9% return to match the performance of the index fund. Compounded over a long term, managed funds are dragged down by the costs and underperform the index, even if they manage to achieve similar annual returns. Fund managers are humans, which means they are susceptible to basic human emotions such as greed, complacency once gaining a lead, and irrationality. By nature, they are paid to outperform the market, which means they must often take additional market risk to get the additional returns. In investments, higher potential returns are often accompanied by higher risks. Index funds remove the inconsistency of human emotions and misinformation, which is what we often call the manager risk. There is no real risk of human error by investing in index funds, since they merely match the market indices. There is a saying by the famed economics John Maynard Keynes, “The market can remain irrational longer than you can remain solvent.” Which is to say, even the most experienced fund manager with the greatest discipline and market knowledge cannot consistently navigate through the insanity of the market, which is often driven by irrational crowds of investors. One of the main ideas of investing in mutual funds is to make investing simpler and more manageable. You want to focus on the more important things in life, such as spending time with your family and building a long term asset that really belongs to yourself. Something that you can work on and control, that sustains your financially independent lifestyle more consistently than just depending on investment incomes. If you don’t know what is the twin engines concept of financial freedom lifestyle, read this. Investing in index funds minimizes the time and energy needed to research funds and managing your portfolio, freeing yourself from the worries of your fund performance vs the market returns. Your returns are the market returns, after all. In the next article, we talk about the best index funds to invest in, and how you should approach index investing to build up a sizable portfolio over time. Hi Steve, actually that’s the best advice one can give to any investor. Don’t invest in what you don’t understand. Hi dan, investing in mutual funds specifically low cost indices is a guaranteed way to get rich slowly as long as you keep at it for long term. Keep up the good work and be consistent.